The Clandestino is a house located in Mirador de Rolando street n16, on the lowest part of the Albaizyn quarter, close to Jardines del Triunfo square, Puerta Elvira, Gran Via and Avd Constitucion. You can access the markets, and commercials areas with all kinds of shops very easily, calle Elvira has plenty of bars for tapas and great nightlife. The bus stop in Parque Del Triunfo goes to the train or bus station, airport and almost any point of Granada. 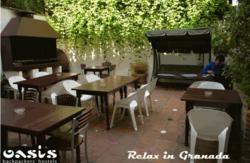 We are in a great place for students too, near to the University of Granada and lots of faculties and academies. We have all the information you need to visit the Alhambra, explore the Albaizyn and Sacromonte, flamenco shows, Arabian baths, the best tapas bars and nightclubs, and all activities than you wish to do in Granada. 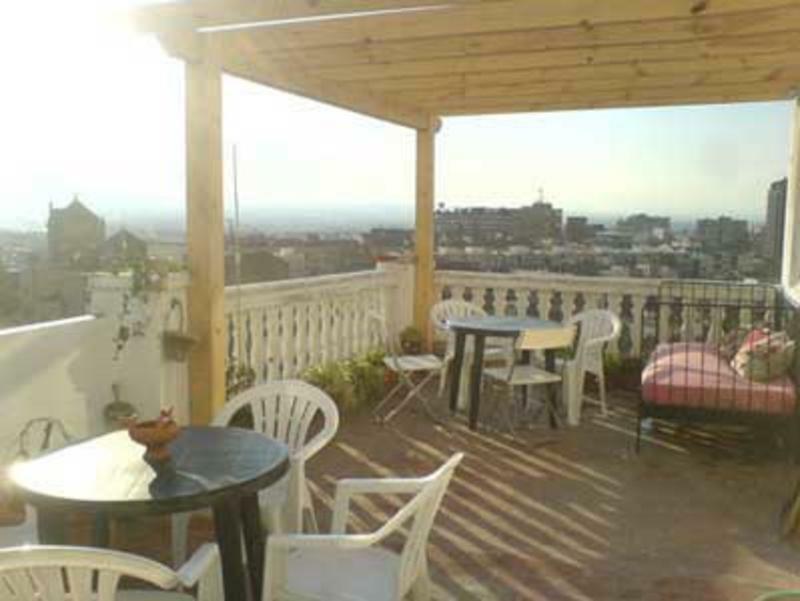 In our hostel, you can find all facilities, fully-equipped kitchen, internet-info room, dinner room, chill-out area and a nice terrace with views over most parts of Granada. 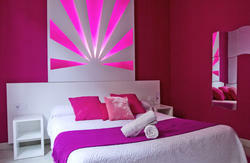 We offer a relaxing atmosphere and a personal attention than only a small place can provide, comfortable beds and shared bathrooms with hot showers. Take bus n3 or 33 and get down in Jardines del Triunfo stop (Triunfo Gardens). You will see a big Spanigh flag and the gardens behind. Take Hospicio Av just in the side of the park, go ahead until the end (the park will be on your left and you will pass Hospital Real building . Follow to get Real de Cartuja street, go ahead and take first one to your right ,Cuesta de San Antonio street (there is a Tatoo Shop on the corner). Go up about 10 meters and you will see a stair in the left side. Get the stair and you will be in our street ,Calle Mirador de Rolando. We are on the left side number 16. Most people does not know the street but a big cottage houses area on top of a hill that have almost the same name!, so if asking for directions tell them either Real de Cartuja or Cuesta de San Antonio, otherwise they might lead you to the top hill cottage houses. Get to the main road Gran Via de Colon towards city center (Cathedral). When arriving to a square with a big Spanish flag you will be at Jardines del Triunfo (a big garden area). Take Hospicio Av just in the side of the park, go ahead until the end (the park will be on your left and you will pass Hospital Real bulding . Follow to get Real de Cartuja street, go ahead and take first one to your right ,Cuesta de San Antonio street (there is a Tatoo Shop on the corner). Go up about 10 meters and you will see a stair in the left side. Get the stair and you will be in our street ,Calle Mirador de Rolando. We are on the left side number 16. Most people does not know the street but a big cottage houses area on top of a hill that have almost the same name!, so if asking for directions tell them either Real de Cartuja or Cuesta de San Antonio ,otherwise they might lead you to the top hill cottage houses. Most taxi drivers do not know the street but a big cottage houses area on top of a hill that have a very similar name!, so if taking a taxi tell them either Real de Cartuja or Cuesta de San Antonio streets otherwise they might lead you to the top hill cottage houses. They must take Carretera de Murcia and then Cuesta de San Antonio street going down. 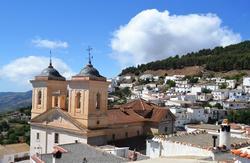 Stop by at the bottom of Cuesta de San Antonio you will see a stair in the left side. Go up and you will be in our street Calle Mirador de Rolando. We are on the left side number 16.